‘Would you tell me, please, which way I ought to go from here?’ Alice speaks to Cheshire Cat. Two years in the army passed by quick. When I left the army I realised that for the first time in my life, there was no clear path I had to take. Prior to that, being in the Singapore education system, you always had more or less a fixed route, progressing from one year to the next and then into the army. I had a few options, I already managed to secure a space at the National University of Singapore in the Business Administration undergrad course. I was also at that time a second year part-time student at the Singapore Institute of Management for the UOL-LSE external program, which meant I could actually complete that course and save two years in terms of time to graduate with a degree (I picked up the course in the army since I had a staff position which enabled me to take night classes). Or I can go pursue my dream of becoming a decathlete at Loughborough University. Now you might ask why I can’t stay in Singapore and be a decathlete. Well, truth be told, you can. However due to the lack of facilities and that they are so far apart from each other, it would be really hard to train consistently (I can attest to that. Every summer when I go back to Singapore I continue to train, but problems such as the weather can severely affect your training schedule due to a lack of an indoor training facility. Also the lack of a proper performance gym with necessary equipment is irritating as well.) The energy you have to spend to overcome these obstacles would already put you behind before you got any training started. When I was in Officer Cadet School, I was shown a video about Dewitt Jones, a photo journalist with National Geographic talking about creativity. I always remembered how he used photography as a metaphor for life. He mentioned that to capture the extraordinary moments, we have to put ourselves in the place of most potential. ‘The place of most potential, the place where I have the most possibility of finding multiple right answers.’ Where was the place of most potential if I wanted to become a decathlete, I asked myself. Back in my JC days, my good friend Nicolas was looking to pursue a degree related to sports nutrition and mentioned about how Loughborough University was one of the places to be, with regards to sports and sports education. I looked it up and saw the amazing facilities, read about their brilliant athletics team and how sporting greats such as Paula Radcliffe, Steve Backley and Lord Sebastian Coe were alumni of the Loughborough Athletics team (not to mention that London was going to be the place where the Olympics was going to happen at 2012). Seeing all that on the website, I was sold. I wanted to go to Loughborough University. So I applied whilst I was still in the army and thankfully managed to get in (I wasn’t exactly an academic success story and the entry requirements for the sports science course was pretty high at Loughborough) and deferred the place to 2008 entry as I could only enter that period after I left the army. I was very sure at that time when I left the army that this would be the path forward, so now all I had to do was to convince my parents and find some funding. 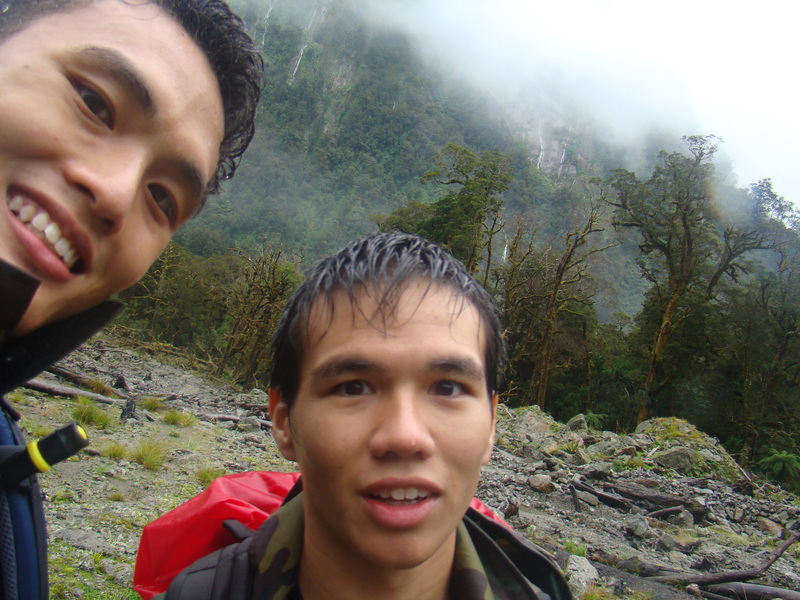 Trekking in New Zealand 2008 with Nicolas Welzl. Funny thing was, Nic went on to do Food Chemistry at NUS on scholarship and I ended up at Lougborough University. Thanks bro, wouldn't be here if not for you. My parents were not very supportive of me going overseas to study sports science and I don’t blame them for it. The cost of being an overseas student in UK is quite high, moreover the career prospects of a sports science graduate back in Singapore is quite limited. The pay scale that does come with it could hardly justify the cost if you look at it from an investment perspective. Every parent wants the best for their kids. They hope that we are able to enjoy and achieve things that they did not and make big sacrifices to make that possible. My parents came from Malaysia to Singapore with little money and a basic primary school education. They never had a chance to go to university or even further their education past primary cause of financial difficulties. It was by sheer hard work that they could rise above their circumstances and today own and run an SME providing my older brother and me the opportunities that they never had when they were young. They inspire me greatly and I love them dearly and did not want to disappoint them in any way. I told them not to worry and that I knew what I was doing. I’ll find a way to fund myself I decided but to be honest I had no idea how the heck I was going to do that then. I wasn’t academically smart enough for a scholarship by the government. I even tried applying for a newly established scholarship by Singapore Sports Council for students but I never heard a single word back from them after painstakingly preparing a breath-taking letter along with the application forms (ok maybe I’m exaggerating a little here about the letter, but what happened was they never did give anyone a scholarship that year and that would not be my first disappointing encounter with the SSC). I had 11 months after leaving the army before university started so I wisely spent the first few weeks doing absolutely nothing. Seeing that I was not doing anything constructive with my life, my Dad got me to work part-time at his company, allowing me time off to train and do whatever else I wanted. Somehow that part-time work resulted in me starting a complimentary business through some opportunities that I encountered and the next thing I knew for the first time in my life, I was making some real money. I had to work insanely hard though, but things were good. In fact in that short time through multiple projects, I made exactly what I needed to study three years overseas. The market was booming and there seemed to be plenty of opportunities right ahead for expansion. I started to think to myself, I can actually make a life out of this. I had a business going, a stable relationship and a car. There wasn’t even a need to go on to get a degree or anything I figured. I thought at most I could just study at NUS and try to run the business at the same time as I was studying. Why risk it? After all isn’t that what everyone dream about, being young and financially successful? But I always found myself asking, was I really happy? On the day before matriculation for NUS, I was still undecided and was still working through the night, trying to rush finish one of my projects in Orchard Road (I worked both day and night shifts at that time). Whilst taking a break and thinking, I realised that I ran out of time and had to make a decision either to stay and study locally, continuing the business, or still have that one shot at being a decathlete. As I walked along Orchard Road, I thought to myself, how fragile a dream can be. The next decision I made would either kill it off or give it a chance to live. As I was pondering about this decision at a crossroad of my life (quite literally actually, I was next to Orchard Road and Grange Road, looking at The Hereen). I looked across at a bus stop with an advert that said two simple words and I realised, sometimes you got to be willing to let go of good, for a chance to get great. And just like that, I found myself letting it all go, packing my bags and heading to Loughborough University. Funny thing was, shortly after I left for Loughborough the credit crunch hit and the economy tanked. The industry I was in went from booming to a standstill. What can I say? I was lucky. Jump forward to Part 3, Part 4 or Part 5. Jump back to Part 1.
if u hadn’t mentioned about your part time degree, I would have totally forgotten about it! i didn’t know there were other rabbit trails before you decided on loughborough. thanks for sharing.. i enjoy reading it and you are truly blessed.